TOUCHED BY AN ANGEL: Crafting for all Seasons #101 Sketch. Our sponsor for this challenge is Milk Coffee who are giving a FAB 3 images to the lucky winner. Here is what i have created for this challenge and I hope that you like it. Ok so I used a 5x5 card blank and covered it with dotty paper from Dovecraft and inked around the edges. Next i added two pieces of contrasting paper at angles towards the centre of the card i had previously distressed them with a Tim Holtz distressing tool. The topper has been created by colouring the gorgeous Lisbeth - Goodnight digi image from Milk and Coffee. I have used a selection of Copic Pens. 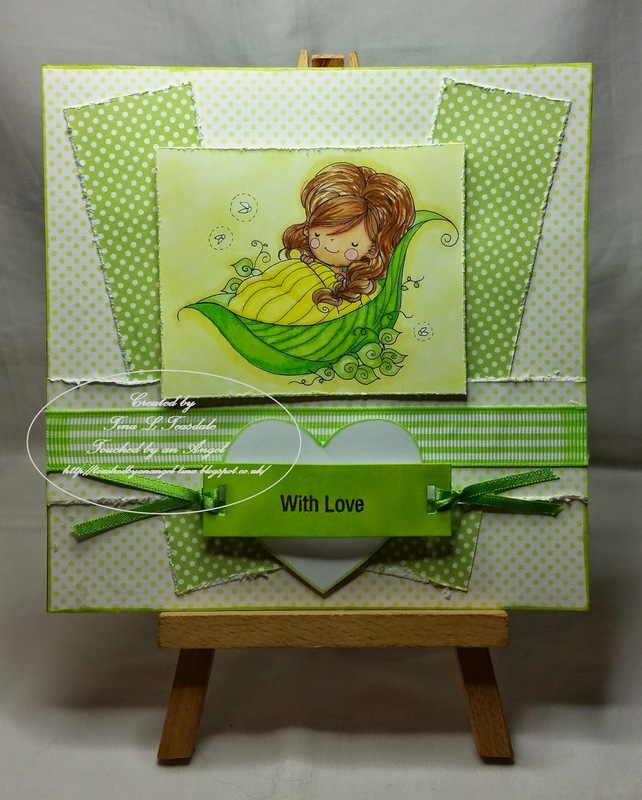 To finish i popped some lovely green striped ribbon a greeting and a heart die cut accross the card . Gorgeous, love the image she is so cute.